Who Is Vera Kelly? is a lively, suspenseful cinematic novel. This coming-of-age story is set in New York in the early 1960s. Working late-night shifts for a local radio station, Vera is struggling to make ends meet—but someone has noticed her technical talent and sharp intellect. She is approached by the CIA. The story takes off, following Vera to Argentina as she explores the growing political unrest and attempts to sniff out any KGB activity. Vera is operating her case incognito; she becomes enmeshed in the social circles she is investigating. The author weaves together excitement and satire as Vera is tasked with activities such as wiretapping a local congressman and infiltrating a group of student activists in Buenos Aires. Vera narrates the life around her, and it is easy to become consumed with her experiences. As she strives to discover who she is, it is charming and endearing to discover along with her. Vera is developed delightfully; she is an absolute treat, irresistibly likable. The book is more successful at its literary prose than it is with the crime and mystery elements of the story. Political themes play in, and metaphors using love and marriage illustrate the significance of politics and its parallels to personal life. The author paints a clear picture of this world and its characters. 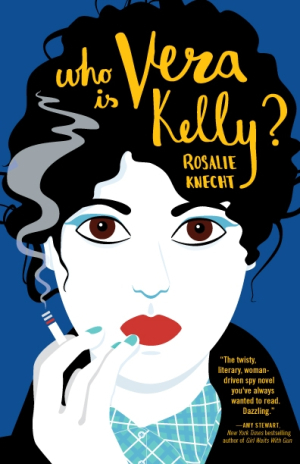 Through a deep analysis of Vera’s experiences, Rosalie Knecht shows what it is like to be pushed to the edge of society and discover oneself while acting under an alias. This is a spy novel for those who do not read spy novels: a delightful coming-of-age story with supplementary themes of love and politics.